At first glance, they may not look like real muscle builders, but weighted vests are one of the hottest pieces of workout equipment on the market right now. They kick your workout up to a new level and build up muscle over time. In this article we will cover the pros and cons of training with weighted vests, a weighted vest workout routine, reviews of all the top brands, and recommendations on how to select the best vest for your needs. Why Add a Weighted Vest to Your Workout? Benefits from using weighted vests have been documented in both aerobic activities and strength training. Note that carrying added weight during exercise calls for extra strength and more oxygen, all the while depleting energy stores. With any form of exercise, the more weight you use, the more your muscles need to adapt to the increased weight. This is the rationale behind the gains in strength and muscular endurance. A research cited in the Journal of Applied Physiology studied the effects of integrating weight to the strength training of subjects who already showed a consistent level of performance. The research was conducted three days a week for ten weeks. The results revealed that leg strength increased by 30% while short-term endurance during cycling and running increased by 11 to 13%. A related study published in the Journal of Science and Medicine in Sport examined the effect on running endurance when warm-up exercises are done with weight vests. Well-trained distance runners wore weighted vests equivalent to 20% of their body weight during the ‘strides’ phase of their commonly used warm-up routine. It was shown that peek running speed improved by as much as 2.9% among subjects who used running weight vest warm-up. Measurements revealed a significant improvement of 6% in running economy. In addition, cardio-respiratory efficiency also manifested a small to moderate improvement. We are aware of the fact that intensity is key when it comes to fast and efficient fat loss. Some people have the perception that walking or jogging for extended periods at a leisurely pace on a treadmill is an excellent way to burn calories. Unfortunately, studies have shown that it is really one of the least effective techniques to burn adipose tissue (unless you are wearing a weighted vest). On the other hand, brief, high-intensity interval-style exercises involving resistance training have repeatedly proved to be the fastest and most effective means to burn fat and build muscle. The primary reason behind this is the intensity of such exercises which forces the body to induce lasting changes in cells that promote fat burn. This goes to show that using a weighted vest is one of the quickest ways to increase the intensity of any exercise or workout regimen. It will prod the body to increase the number of calories that are being consumed to keep on going at a heavier weight. As a matter of fact, a study revealed that wearing a weighted vest while doing a standing workout speeds up calorie burn by as much as 12%. Cardio exercises like biking and running are great for working your cardiovascular system but they are not the only means to get an excellent cardio workout. If you are lifting weights, you may have noticed that your heart rate rises considerably and there are instances when you become short of breath. The reason behind this is that regardless of the activity, adding more weight boosts its metabolic cost (i.e. energy cost). In response to such increased demand for energy, your body sends the heart and the lungs into overdrive, strengthening both and increasing the body’s ability to use oxygen efficiently. Using a weighted vest during workouts can further augment this effect, and even amplify the intensity of bodyweight exercises so you get a full-on cardiovascular workout. The benefits of challenging your cardiovascular system will eventually trickle down to other areas of your training. A study cited in the European Journal of Applied Physiology and Occupational Physiology showed that endurance athletes who wore weighted vests had increased maximal oxygen consumption (VO2 max) and lactate threshold when compared to study subjects who didn’t wear weighted vests. Another study published in Medical Science Sports Exercise looked into the effects of wearing weight vests during treadmill walking. The study involved ten subjects walking on treadmills under four varying weight vest conditions (i.e. 0, 10, 15, and 20% of body mass). The study found that while weight vests did not have much effect on subjects walking at slower speeds, there were notable differences at higher speeds. Moreover, a lower body mass percentage as opposed to a higher body mass percentage in the weight vest yielded very different results. It was then concluded that the use of a weight vest can increase exercise intensity and metabolic costs, both of which strengthen the cardiac muscle. Aside from strengthening your muscles, wearing a weighted vest during workouts will increase the load that is transmitted to your bones. This extra load can increase bone mass by stimulating osteoblasts to produce a matrix that becomes mineralized in response to the demands being imposed on your skeleton. Simply put, your bones and connective tissues become stronger and denser in order to handle the added weight. Another related benefit is that it would be easier to do future workouts since the musculoskeletal system has been strengthened. The chance of incurring injury will also decrease due to improved stability and support. Equally important is the fact that having strong bones helps in warding off degenerative diseases of the skeletal system, like osteoarthritis, as you age. Bodyweight exercises: exercises such as pull-ups, squats, push-ups, and many others can be amplified if you include a weighted vest in your routine. But be sure to choose an appropriate vest that allows for this type of activity without discomfort or injury (option #1 below is our favorite, be sure to check it out). Running: runners will find weighted vests particularly beneficial since they can dramatically improve length strength and endurance. Walking: if you take pleasure in a nice long walk, you can always boost the number of calories you burn during this activity by simply adding a weighted vest. If you intend for this to be your main use for the vest, be sure to go with a lighter, low profile option (scroll further down the page for a recommendation). Jumping: if you want to enhance your vertical leap, you can always try adding a weighted vest to your routine. Your muscles will quickly adjust to the extra weight, then once you remove the vest, you’ll notice you’re jumping higher and with less effort. Sports: the additional weight can boost athletic performance, regardless of the sport you engage in. Training with a weighted vest is common in professional sports, like the NFL, for this reason. Thin Profile: The Hyper Vest PRO features a thin profile, which allows for full range of motion. This vest won’t be weighing you down, or compressing your chest and making it difficult to breathe. This vest has a design unlike the others on this list, it’s incredibly thin and can be worn on its own. It’s just easy to move in this vest, which makes it great for starters, or novices. Adjustable: This vest comes with 10 pounds of steel weights, with each weight bar weighing 2.25 ounces. The way the vest is designed allows you to put the weight where you want; you can easily slide the weights in and out. You have full control over the weight distribution of this vest, so you can target certain areas. Comfortable: Lastly, this vest is super comfortable, and feels just like wearing a compression shirt. The open side panels and lightweight fabric make the vest super breathable, which is always a plus when you’re working out. The side panels may seem a bit strange at first, but once you give them a chance, you’ll see how awesome they are. The fabric is also odor-resistant, so you don’t have to smell your own sweat on the vest if you use it two days in a row. Another thing I love about this vest is that it is literally great for anybody. As I already mentioned, it is good for beginners or novices, thanks to its adjustable weight system. It’s also great for both men and women. It’s not too masculine, and not too feminine. It’s simple, gray design looks great on anyone, and with a wide range of sizes, it really is great for anybody. A lot of vests come in a one size fits all, and while sometimes that is true, often times it is not. The only downside I could find on this vest was the side panels. Like I said, it may take some adjusting when you first start using the vest. The sides are essentially compression straps, which aren’t uncomfortable, but if you’ve never worn anything similar it can take some getting used to. However, once you get used to it, it’s something that you don’t even notice and you’re able to enjoy all the other benefits of this great vest. Sand Filled Weights: Instead of steel weights, like the previous vest, this vest has sand filled weights, which contour to your body better. With weights contoured to your body, this vest is super comfortable. Some people also just prefer the way the sand weights feel over steel weights. I personally don’t have a preference, but I see the appeal of them both. Reflective Trim: This vest features a reflective trim, keeping it simple while maximizing safety. The reflective trim makes it so that you can be seen easier when you are out at night. Headlights from cars reflect off of this vest and allow drivers to see you. Since safety always comes first, this is a pretty useful feature. Versatile: Because of the easy, one piece construction, and sand filled weights, this vest is good for all sorts of activities. The weights are able to move with you, and the breathable design allows for lots of movement. With this vest, you can do runs, hikes, lunges, squats, jogs, push ups, pull ups, and more. This vest isn’t made specifically for running, or specifically for weight lifting, it just makes a great overall vest. This Pure Fitness weighted vest comes with a limited 90 day warranty. I love this because it means your purchase is basically risk free, if anything happens you know you didn’t waste the money because the warranty is there. 90 days is plenty of time to assess the quality of this vest and get a feel for the durability. If you have been using weighted vests for a while, or consider yourself advanced, this vest might not be the best for you. However, it is great for beginners and amateurs, and there is always a 40 pound option for those of you who are advanced. 1 Pound Increments: This vest comes with weights of 1 lb. Increments, up to 20 pounds. I love this because it makes them easy to work with and keep track of. Instead of some strange number that’s impractical, like .36 pounds, 1 is a whole, easy number so you can always know exactly how much weight you have on. FLEX Weight Design: This weighted vest was specially designed to move with you as you exercise. The FLEX weight design causes the vest to contour to your body, instead of hanging off and slowing you down. With the weights close to you, you are able to comfortably add some resistance to your workout. Customized Fit: Also adding to the overall comfort of this vest, the adjustable Velcro closure makes it so you can get it exactly as tight as you’d like. 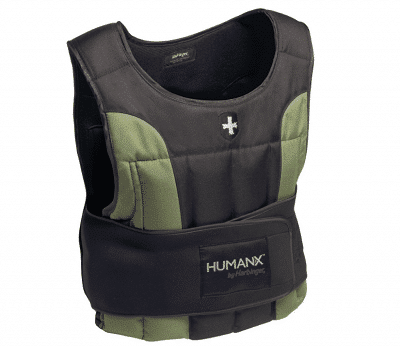 The HumanX vest features an adjustable belt, which is easy to secure and can accommodate most people. I like this because it means you don’t have to worry about ordering the wrong size and having it not fit, which is always my biggest fear with online shopping. This vest is incredibly durable and is made from high-quality materials. 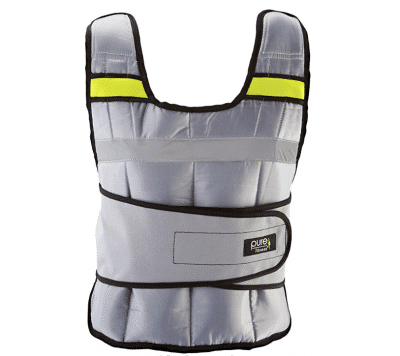 The vest has a sturdy, abrasion resistant outer shell, and dual padded cushioning. The cushioning across the shoulders and chest make this vest comfortable all over. The only downside with this vest is that you have to hand wash it. It isn’t hard, but it isn’t as easy as machine washing either. However, this is pretty typical of weighted vests, most of them cannot be machine washed. The ZFOsports adjustable vests come in various weight options. The one we tested was at 60 lbs, but our impressions should apply to all the others as well. Some of the first things you notice about the product are its high-quality materials and solid construction. We felt like it could handle the stress posed by any weights and type of exercise with no problems, making us confident that no accidents would happen due to malfunction. The velcro used was strong as well, everything giving us the impression of a durable product. Wearing the vest was a fairly comfortable experience as well. While it’s impossible to avoid the fact that carrying weights on your torso will be exhausting, we found no uncomfortable situation that was a fault of the vest itself. What you should know from the start is that this product is bulky and, therefore, indicated for exercises that are related to weight lifting. In other words, you cannot have the agility required by various cardio exercises or any other activities where fast movement is essential. There is no other way around it, no matter what type of product you choose. We also liked how adjustable the vest is. The 4 lbs increments in weights and the maximum weight of 60 lbs also make this suited for beginners and experienced users alike. Another aspect where the versatility impressed us was the size. We tested the vest on various members of our team, and we found that it fit different body sizes, being usable by men and women alike. The drawbacks to this vest are mostly related to the price. Variations can be incredibly high, going from $50 up to $200+, depending on the shop. Even on Amazon, you can find it either at around $50 on sale, or $159.99 as a standard price. Obviously, we are not against having great sales, but we find these variations to be quite unpredictable. Shipping costs can also be quite high, running at close to $40 on Amazon. The ZFOsports vest is a solid product that we have no problem recommending. Pricing may variate quite a bit over time, but that should not be a serious deterrent in the grand scheme of things. You can simply wait, and a good deal will appear. The fact that the weights are removable for this vest puts it off to a good start. A beginner could start small at 12 lbs and then work their way up, without having to buy extra vests simply because they got stronger in the meantime. Imagine having a drawer full of different weight vests simply because you gained strength and needed more resistance. 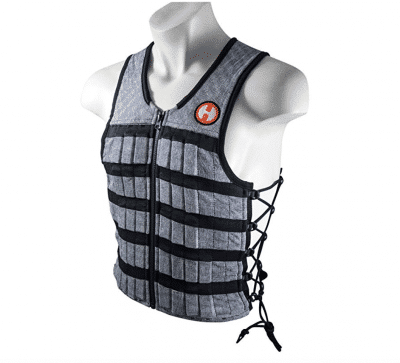 With this vest, you can add and remove weights whenever you want, making it very convenient. However, there is a pretty obvious problem with the sizes. Although the vest is supposedly “universal size,” it won’t really fit you unless you are an M size or around that. If you are an 185 lbs man, the vest will be too small for you. The same thing goes if you are a 130 lbs woman: it will be too large. It will adjust, but not enough to make it a comfortable wear. If anything, it will restrict your movements, and you won’t be able to perform the exercises correctly – beating the entire purpose of purchasing that vest. The vest in itself is actually very nice, but it’s a real shame that they made the sizes fit just a few people. The price is good compared to other vests. You pay according to the weight you purchase and compared to other options, we found this pretty cheap. We’ve seen many other similar vests online with the same issues, and they were even more expensive – so we believe that we’re getting fair services for what we paid. If only they could work on the size of the vest (either include different sizes or make it more adjustable), this would be a great addition to your workout. Unfortunately, right now, it is limited to people who are already fit and slender. Considering that the vest weighs 12 lbs, we didn’t think that this vest would make that much of a difference. However, after the tests, the differences are relatively obvious – you start to sweat! You can use it for cardio, yoga, weightlifting, jogging and even something as simple as stair walking. If you are a size M, then the vest should fit you snuggly. You can do burpees or any other activities, and your vest will still stay put – as long as you strap it on you. However, the “one size fits all” isn’t exactly as accurate as it seems. If you are a plus size or have a broader back, the vest may feel too tight on you, and you won’t be able to perform the exercises properly. The same goes for petite-size women – it will move around a lot. As a result, you will restrict your movements (because it flops a lot) and you will no longer perform the exercises correctly. The pocket is convenient, and you can fit a cell phone in there – as long as it’s small. A smartphone won’t fit, but it can hold your keys while you go walking. It isn’t really recommended to keep stuff in there if you’re doing anything plyometric or explosive. Another cause for concern may the fact that it puts a lot of weight on the neck, shoulder and upper back. While it may not be a problem if you already have experience in fitness, it may cause you problems if you had shoulder, neck or back issues. It would have been better if they made the weight adjustable or sold it in 8 to 10 lbs. An idea for ladies would be to wear it “upside-down,” so that it fits more snuggly. Still, the vest is not a bad addition to your workout. Overall, this product is very good; however, it could have been better if it was made in more sizes and with more straps so that it wouldn’t move around as much. The vest brings some attractive options for the money. First of all, it feels comfortable to wear even during an intense workout. While it is easy to see why carrying weights when exercising will still pose a challenge, we found that the vest itself did not get in the way of your activities in any way. The straps are adjustable and allowed a great fit for various body sizes. We particularly liked the inside of the vest – there are textured panels that secure the weights to your body, preventing them from moving all over the place during your exercises. Another good thing that the product has going for it is the improved flexibility compared to other vests. While you will be limited in your torso movement due to the weight itself, the freedom of movement for your arms and abdomen muscles is greater than usual. As to things that we did not like, we have to mention the fixed weights first. The vest we tested weighed 20 lbs, and there was nothing we could do to adjust it. We understand that it comes in multiple weight options, but not being able to switch back and forth is a big negative. Beginners may find it too difficult to use; others, on the contrary, may conclude that it does not provide the resistance they need after reaching an advanced level of fitness. It is important to keep in mind that your own body and preferences will be the ones that decide whether this vest is a good fit for you. Compared to others that you can bring to the exact weight needed, this may be the biggest disadvantage. Another drawback is the fact that the vest seemed less solid overall than some other models on the market. We were left to believe that durability may become an issue over the long term. All in all, the vest does offer good value for the money you pay. If the non adjustable sizing isn't an issue and the vest is able to maintain its durability over time, it is a nice looking and comfortable option. This vest is pretty good if what you are doing is strength training. Along with the weights that you are already lifting, this vest will add a nice touch to your shoulder and upper body muscles. The size is very good, and it can even fit a petite female without any problems. However, just as we recommend it for strength training, this vest won’t do you any justice if you are a runner. The material will rub against your skin, and it may start bouncing from the dynamic movement. It probably won’t cause any rub burns if you are wearing any long sleeved clothes, but it will still be uncomfortable to wear (the sweat will start sticking to your clothes, and once more, it won’t be pleasant). If you are a sweater, then you probably won’t like to wear anything more than a tank top during your workouts – which would make things pretty uncomfortable for you if you are wearing the vest. The material is soft enough so that you don’t feel it over your clothes, but it’s really rough on the skin if you start running and let it move around. The price is kind of high when compared to other vests we’ve found, but it makes up when it comes to the sturdy construction. It straps well to the body, and you can do your workout without having your movements restricted. The vest will stay in one place. Overall, we believe that this vest is a good acquisition if what you’re interested in is strength workouts. My only advice would be for them to work on making the material softer so that it does not rub on the skin when it moves around. It would be great if you could also use this vest for running. The weighted vest is a lesser-used piece of gym equipment, but it is actually an excellent tool to build muscle, burn more calories, and add variety to your workout. As the name implies, it is a vest, but one with pockets that you can fill with weight plates. The principle behind it is quite simple: by adding distributed weight, the vest makes your body work harder when performing various physical fitness activities. If used correctly, weighted vests can have substantial benefits in training the cardiovascular system and increasing maximal oxygen consumption (VO2 max). Moreover, the load from the vest promotes a stronger musculoskeletal system, as your bones become denser and sturdier to handle the added weight. Below are some of the top workout routines in which you can incorporate the use of a weighted vest to challenge your body. This is a warm up routine which must be performed when you are about to do a sprint-based cardio exercise. Set aside about 16 meters of space to work with and do each workout for 30 seconds before moving on to the next exercise. Repeat the circuit 4 times. High knee running – Run forward and maintain a steady pace, raising your knees as high as possible in front of your body with every step. Grapevine – Do this classic warm up exercise by moving laterally. Begin by stepping sideways with your right leg and then cross your left leg behind it. Move your right leg out laterally and then cross your left leg in front of it. Continue this pattern while moving as fast as you can and swing your arms to support the movement. Lateral slides – Again moving sideways, squat low to engage your gluteals and quadriceps. Stay light on your feet so you can move fast. Step your right leg laterally and move your left leg to meet it, then move again to the right. Avoid crossing your legs as you slide. Change your starting leg after every circuit. Power burpee – Squat down and plant your hands on the ground. Jump backwards to a high plank and then lower your body to the ground. Press back to high plank and jump back to your starting position. If you can, leap and pull your knees high in front of you, touching them before landing. Mountain climbers – Commence in a high plank position and pull one knee toward your chest. Plant the ball of your other foot firmly on the ground. Hop your legs up and then switch their position. These warm up exercises are ideal before strength training because they have been designed to target all major muscle groups through dynamic and functional exercises. Do the following for 1 minute then repeat the circuit twice. Step ups or Stair climbs – You may use a single step or a flight of stairs. Step up or walk up the stairs and then down for the first 60 seconds. Prisoner squat – Put your hands behind your head and set your feet shoulder-width apart. Do a body weight squat for 1 minute, focusing on putting your body weight in your heels while keeping your torso upright. Spider pushup – Engage your core and upper body with a full minute of spider pushups. While bending your elbows and lowering your chest to the floor, raise you right knee toward your right elbow. Put your right foot back on the ground while pressing yourself back to the starting position. Repeat the pattern on the other side. Side plank hold – Start in a side plank with your right forearm under your right shoulder, your hips lifted and your feet stacked so your body is straight. Hold the position for 1 minute. If needed, rest every 20 seconds before continuing. Change sides on the second circuit. Modified pull up – Use a low bar for support. Hold the bar and put your legs under it, fully extending your arms and legs so your shoulders are below the bar. Bend your elbows and press your scapulae together to pull your chest toward the bar. Lower your body slowly to the starting position and continue for the full minute. Now that you have loosed your muscles and have your heart pumping, you can move on to the more explosive movements and body weight exercises using the weighted vest. Before trying the following exercises, see to it that you can perform each one without the vest on. Also, be careful and workout smart. In case you feel exhausted or you start to lose proper form, STOP! Rest and complete the workout if you feel you can do so without inflicting harm to your body. For the following workouts, it is advisable to start with a 10-pound weighted vest and increase the weight gradually over time. Perform these box jumps in the typical manner, but concentrate on landing quietly when stepping down from the box. Don’t slam your feet on the floor. Use the power from your legs to cushion your landing. Repeat the circuit thrice and take a break as needed between each circuit. Step 1: Begin by raising your rear foot onto a 12-inch platform. Step 2: Stand with your back facing a box or bench of equal height. Move one foot back and put the top of the foot on the box. Step 3: Lower your back knee towards the floor by bending your front leg. Step 1: Hang the TRX cables on a stable platform. Step 2: Hold the handles firmly and hang directly under the ropes. Step 3: Allow your arms to extend up. Step 4: Pull your body up to the handles just below your chest. Step 5: Lower yourself back down. Step 1: Stand with your chest out and back straight. Your feet must be a little wider than shoulder-width. Step 2: Put your fingers behind your head and pull your elbows back so they are in line with your body. Step 3: Commence the exercise by pushing your hips back and doing a squat. Pause and then push yourself back up as fast as possible while maintaining proper form. Step 1: Stand with your feet shoulder-width apart and your toes pointed slightly outward. Step 2: Keep an upright torso and put your hands on your ears while pulling your shoulders and elbows back. Step3: Lower your body into a squat position by bending your knees and pushing your hips back. Continue until the crease of your hip drops below knee level. Weight vest training is generally regarded as safe, but there are a few things that you must keep in mind. Ease your way in: Note that much of the weight of the vest is borne by your shoulders and back, so start light and gradually increase the load. Don’t go too heavy: You may start working out with just 2% of your body weight. While some weighted vests can hold up to 150 lbs, you shouldn’t be in a hurry to load up because there is no evidence to prove that more is better. After you become accustomed to wearing the vest, increase the weight gradually to 5-10% of your body weight. Snug yet comfy: Wear the vest in such a way that it sits close to your torso and won’t shift wildly while performing exercises. It must fit like a second skin so you are less likely to make unnecessary changes to natural movement economy. Start with basic exercises: Ignore those insane weighted vest workouts that involve crazy plyometrics. Begin with the basics and focus on form. Consider this: if you add weight to a difficult move but your form is less than ideal, you are likely to mess up your form even more and make yourself more susceptible to injury. Injury: if you’re not used to handling the extra weight, or if you don’t secure the product accordingly, you are prone to suffering from injuries. Overheating: if you’re wearing the vest while engaging in strenuous workouts, you may be subject to overheating. Ideally, you should choose an item that contains cool wicking fabric. Restricted flexibility: since the vest limits your technical skills, you may not be able to engage in your usual training, since it impairs your flexibility. Joint pressure: joint pain is quite common; if you commonly deal with it, you should stay away from the weighted vest, as it will increase the weight supported by your joints, leading to pain and even injury. Back issues: if a weighted vest isn’t designed accordingly, and the weight isn’t distributed evenly, you may be subject to back problems. A weight vest is a great investment if you are in shape and capable of making good use of it. But be ready to fork out around $100 for a decent quality vest and a couple more bucks for additional weights. Once you have all your gear, you need to think about your fitness level. Going too hard too fast is a great way to get yourself injured. If you are a beginner or if you don’t exercise regularly, it is highly recommended you start light and slowly add more weight as you become more experienced with the feel of wearing a weight vest. Too much load will put a huge amount of pressure on your neck, shoulders and upper back and cause you to lose your balance if you’re not careful. Start with a load that is roughly 5% of your body weight and work your way up from there. Lastly, always stretch and warm up before you begin your workout and stay hydrated. The first thing you’ll want to consider is your personal limitations. I’m not one to tell someone they can’t do something, but you have to be realistic with yourself. If you’ve never used a weighted vest before, you definitely shouldn’t try to start with a 50 pound vest. The best way to train with a weighted vest is to start with a light one and work your way up. If you are brand new, and not especially active to begin with, I recommend starting with something like 10 pounds, maybe more if you are already active. You should also consider your budget. Usually, higher end vests tend to be more expensive, but there are lots of good quality, affordable vests. You shouldn’t let your budget limit you, but it is good to be aware of what it is. You can really work with any budget, setting one just helps to keep you from overspending. Adding constant weight during an intense workout comes with its risks. Before you buy anything, it’s always a good idea to know all of the risks associated. The heavier the vest, the more risk of injury there is during certain exercises. The idea is to make your body work harder, but very heavy vests can make your body work too hard, especially if you aren’t ready for that weight, and actually result in injury. They can also lead to overheating during intense cardiovascular exercise, so be sure to keep hydrated. Lastly, you should think about what kind of activity you plan to do with your weighted vest. What type of activity you plan to do may influence what kind of weighted vest you should look for. For example, if you plan on doing a lot of cardio with your vest you should look for something bulky, and something lightweight is better for weightlifting. GottaHaveFit.com has an affiliate relationship with some companies or products on this page & is a participant in the Amazon Services LLC Associates Program. We do not accept compensation in exchange for a positive review. All opinions are our own.